Get a Taste of the Wild Side at the Food Truck Safari! Posted by Brittany Bosher on Friday, January 29th, 2016 at 10:07am. February 6, 2016 from 4:30pm to 9:00pm at the Palm Beach Zoo in West Palm Beach. You and your friends and family can enjoy the sounds of live music performed by the Shin Dig Duo and Andre Michaud. Aside from the fabulous food and great music, the best part about Food Truck Safari is the animals! Several of the zookeepers will give educating talks about the animals. You can get up close and personal with a number of the exotic creatures the zoo protects. Ticket sales and a portion of the food truck proceeds will go to the Palm Beach Zoo’s operations. They support only sustainable practices when it comes to the food trucks and the other fun activities that take place in the zoo. They support protecting the animals and the environment all while educating future generations. The Palm Beach Zoo urges all food trucks to apply sustainable practices in their daily operations. The zoo will give their “Sustainability Award” to the truck that excels in the most environmental and conservation sustainability categories. Ticket prices for the Food Truck Safari are $9 for adult members, $10 for adult non-members, $6 for child members, $7 for child non-members and kids under the age of 3 are free. 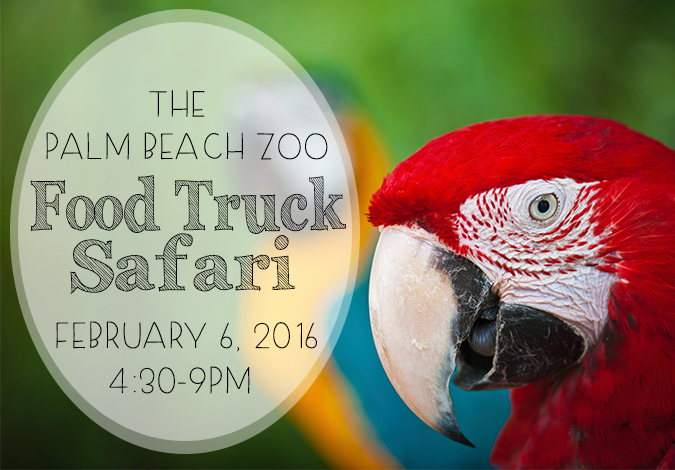 For more information about the Food Truck Safari please visit The Palm Beach Zoo. Click on the following link for more about Palm Beach Real Estate.